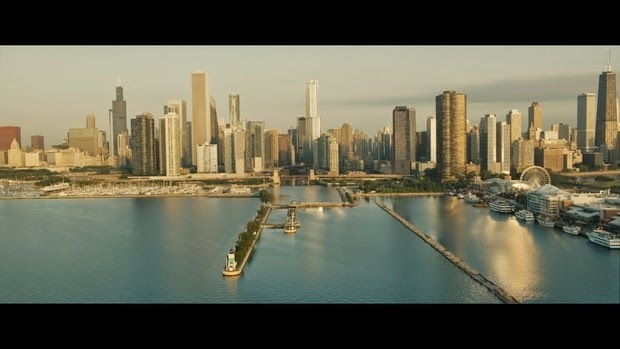 This really cool featurette reveals some of the amazing visual effects used to create some of our favorite scenes in the DIVERGENT movie. Below is an in-depth write up from the VFX team in which they talk about the challenges they faced, techniques used, and the thought processes behind each decision. 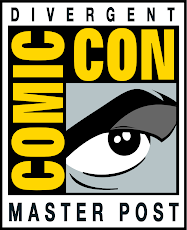 Visual Effects Producer Greg Baxter (Jack The Giant Slayer, Jonah Hex), Method Studio’s Visual Effects Supervisor Matt Dessero (Iron Man 3, Cloud Atlas), and Visual Effects Supervisor Jim Berney (Batman Forever, The Matrix Reloaded, Lord of the Rings: The Two Towers) were tasked with bringing author Veronica Roth’s vision of the future to cinematic life. In tackling the roughly 1024 visual effects shots, however, the trio made every effort to use a light touch and keep the audience’s attention focused on the characters. “Neil Burger was clear that he didn’t want it to be a Blade Runner-type world,” Berney recalls of his early conversations with the director. 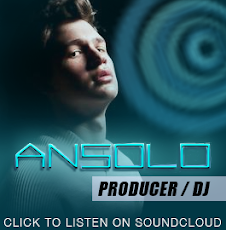 “You don’t want your eye to gravitate towards the effects to the point where you start to really question them or tear them apart." 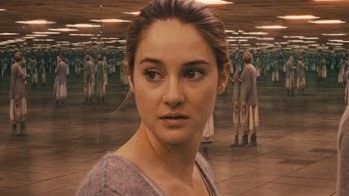 As Tris walks towards a mirrored wall she notices something is not quite right. As she slowly turns, more and more walls are revealed, all of them mirrored and causing hundreds of her reflections to populate into the distance. 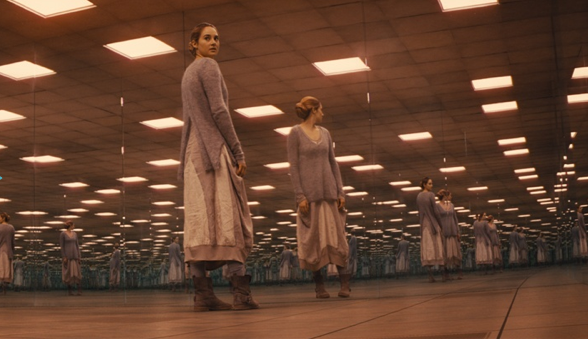 To successfully accomplish the sequence – in which Tris finds herself surrounded on all sides by mirrors and interacting with her own reflections – Dessero’s team relied on the previs to chart a course for their cameras in the 100 by 80 foot green screen stage. A central origin point in the space was decided upon and then the team began reverse-engineering things to mimic their mock-up. “This entire sequence of 36 shots was incredibly challenging both on set and in post, and ultimately very gratifying to see accomplished and one we’re very proud of” summarizes Matt. 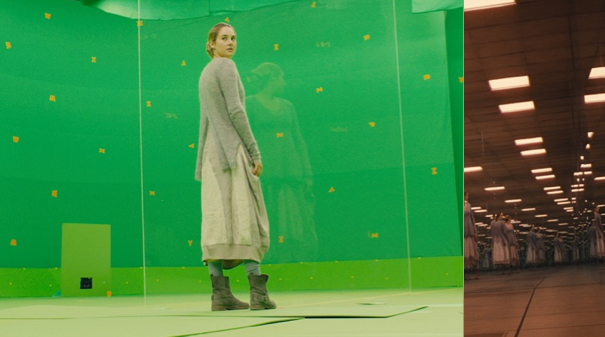 Following the grueling two-day shoot, Method Studios took the footage of Tris and all her various reflections and spent months perfecting the final look of the sequence. In addition to the Mirror Room, however, they also created the CG dog Tris wrestles during the aptitude test, the flock of birds who attack her in another sequence and digitally reconstructed Chicago’s famed L Train. Several exterior scenes, including some ‘epic’ aerial shots of the destroyed city were completed by using various techniques from projected matte paintings to full CG. Wind turbines and cabling are added throughout the city and modern day street furniture and signage was meticulously removed. Some shots contain over 500 turbines and are populated with hundreds of digital extras. For the menacing 130 foot fence that surrounds the city, a 30 foot cement block was shot on location to which Method added 100 foot tall metal towers and guard shacks. A digital vegetation system was created to replace the flowing blue water in the river and Lake Michigan with trickles of brown water, dry grass and swampland. 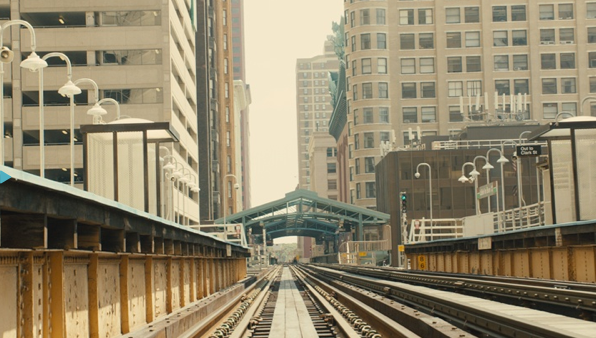 Method also created numerous versions of Chicago’s famed elevated train, with CG tracks and futuristic train cars. 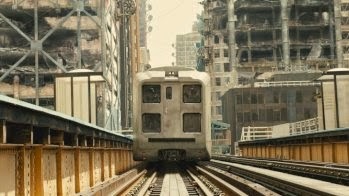 For one particular action packed sequence where Tris and others arrive at the Dauntless Compound, a variety of brick buildings were created and a huge glass atrium, with digital doubles jumping from train cars to rooftops. 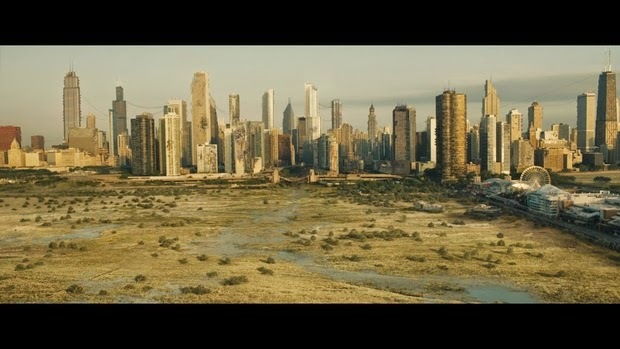 Many of the Method built assets used in the construction of the city were shared with other VFX vendors and included digital doubles, turbines, trees and lake beds. 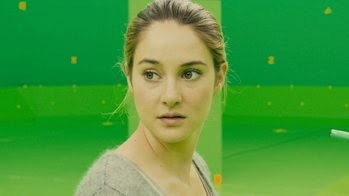 In addition to the work described above, Method also created effects for Tris’ fear test. This sequence begins with her being attacked by hundreds of birds which were created in 3D. The shots are beautifully lit so that the camera catches the light through their feathers and so it was important to finesse both the models of the birds and their aggressive flight action. The simulation progresses to an underwater sequence that was shot on a stage in a water tank with a stunt double. Method artists added a spider web of cracks to the glass and augmented the large plates of exploding cracked glass in the wide shots. If trying to keep the effects work “invisible” still somehow led to some of the most complex challenges they’ve faced in their careers, the trio maintains that they were well aware of what they were walking into. “We knew there was a lot riding on this one and it had to be a really successful first piece in order to get the franchise going,” Baxter points out. 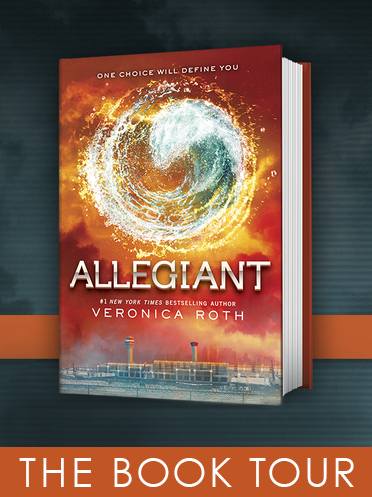 Given that Divergent just surpassed the hundred million dollar mark at the box office, they should rest easy. It’s a safe bet they’ll have a bit more budgetary wiggle room the second time around. 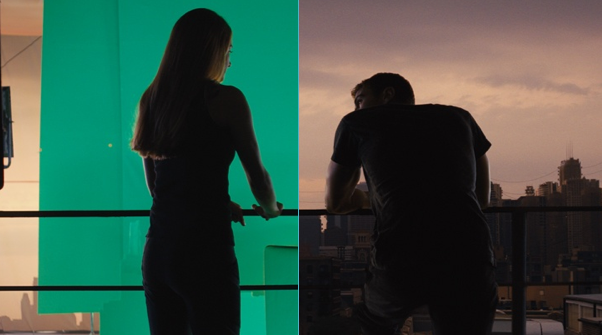 Note: This article is from a combination of 3 recent articles on the VFX in DIVERGENT.